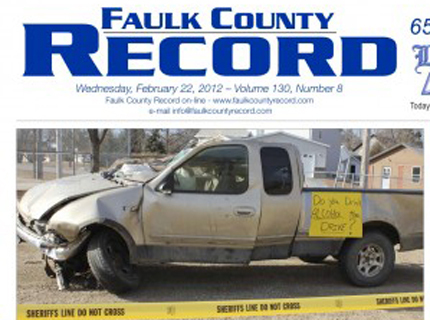 The Feb. 22 issue of the Faulk County Record featured a photo intended to serve as an object lesson to teens to think before they drink and drive. The truck was in a crash in Faulk County early the morning of Feb. 11, and both the driver and the passenger sustained injuries. Both were under the age of 21. Alcohol was a factor in the crash, according to Faulk County Deputy Sheriff Brent Koens. “Their names (of the driver and passenger) really do not matter,” Koens said. “If this type of activity continues, you could just as well put you or your child’s name in their spot. The only problem is that you or your child might not be as lucky!” The truck was parked in a prominent location in Faulkton a week ago for community and youth education purposes. The Britton City County Council is concerned about the status of Link It, a telemarketing company located on the east edge of Britton, and held a conference call on Feb. 16 with Link It CEO Wayne McFarland to discuss the situation, according to the Britton Journal. The major concern was that the business is not current on its rent payments, but McFarland said a verbal arrangement had been reached with the landlord. McFarland said the recent recession had hit the company hard, but that it is doing all it can to stay afloat. The business is slated to receive $100,000 in funding from the city at the end of two years if it achieves certain benchmarks. Link It also has call centers in Watertown, Milbank and Roslyn. The Britton Council also discussed an idea put forward by resident Paulette Kelsey to establish an enhanced farmers market, which she suggested could be called the Greater Britton Country Fair. “It would feature locally grown produce, flowers and plants; specialty foods’ jams, jellies and baked goods; live demonstrations; music by local artists; festivals and events,” according to the Britton Journal. The council indicated it would provide support for the event. “We think this is one way to make Britton a destination to drive to and not through,” Kelsey said. As reported in the Dakotafire feature story last week, the Langford school district opted not to go to a full four-day week in its meeting on Feb. 15. Read the full story from the Langford Bugle here (you’ll need to register, but it’s free to do so). “The Langford Area boys basketball team has secured the number one seed in the District 2 tournament and is riding a nine-game winning streak, but Coach Paul Raasch knows his club faces a tough challenge ahead,” according to the Langford Bugle. Bruce Steiger, the 53-year-old Leola man charged with nine felony counts related to marijuana growing, has pleaded not guilty. He remains in custody in the Edmunds County Jail, according to the McPherson County Herald. Teens in Redfield and Clark are among 65 “teen teachers” who have been trained through a new South Dakota State Extension program called Strong Bodies, Strong Futures, Teens as Teachers, as reported by the Redfield Press and the Clark County Courier. The teens will have opportunities to make a difference in their school and community by creating lesson plans for grades 3-5 on topics relevant to S.D. Health Education Standards. “The project addresses the state statistics which indicate 85 percent of youth eat less than five servings of fruit daily, 89 percent less than three servings of vegetables daily and 81 percent do not participate in a daily physical education class,” according to the Redfield Press. “The result — the percentage of South Dakota youth who are overweight and obese is higher than the national average.” Teens who complete the program receive a $500 scholarship to the school of their choice. Other partners in the program are the South Dakota 4-H Foundation; South Dakota Coordinated School Health; South Dakota Discovery Center; South Dakota Family, Career and Community Leaders of America chapters; and South Dakota school districts. Read another story about the program here. The Faulkton Library is going digital, according to the Faulk County Record. “Our new automation system should be up by the end of February,” said Librarian Judy Dixon. With the new system, patrons can browse e-books and audio books at overdrive.com. Patrons will need to get new digital cards even if they are not intending to use e-books so they can use the new system.